Please note that EEEKit and Amazon.com are the only sellers on Amazon that are authorized to sell products with the EEEKit name. Buy from sellers EEEKit or Amazon.com to ensure authenticity and better service. 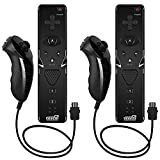 Contoured to perfectly fit a players hand, the Nunchuk controller builds on the simplicity of the Wii Remote controller and goes an extra step to meet the needs of gamers. Used in conjunction with the Wii Remote controller. Connects to the Wii Remote controller at its expansion port. Region free, It can be used for any version of Nintendo Wii. Players are free to hold them in whichever hand is most comfortable. This version, 100% compatible with all US games, software, hardware, and everything else. Powered by 2 AA battery. (NOT Included).